The 2018 Vincentric Best Fleet Value in Canada Awards process analyzed over 2,400 vehicles using Vincentric cost of ownership data to determine which vehicles deliver the most value to fleet operators in Canada. It is always best for fleet operators to use current cost-of-ownership data to make informed vehicle acquisition decisions. The 7th annual Vincentric Best Fleet Value in Canada™ Awards were announced today with General Motors of Canada leading the way with eight winning vehicles while Ford Motor Company of Canada also performed well with six fleet award winners. Other brands with multiple fleet award winners were BMW, Mazda, Mercedes-Benz, Cadillac, Infiniti, Mitsubishi, and Subaru. 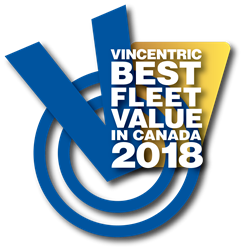 Additional information regarding all of the 2018 Vincentric Best Fleet Value in Canada™ award winners and the Vincentric award selection methodology is available at http://www.vincentric.com.